The Nashua School District is seeking Teachers for the upcoming school year. We support our new teachers with mentors, peer coaches, peer cohorts and our outstanding professional development program. Join us in making a difference in the lives of our children and the community. We are interviewing for all certification areas. Teacher vacancies are posted as they occur; typically through July 2019. 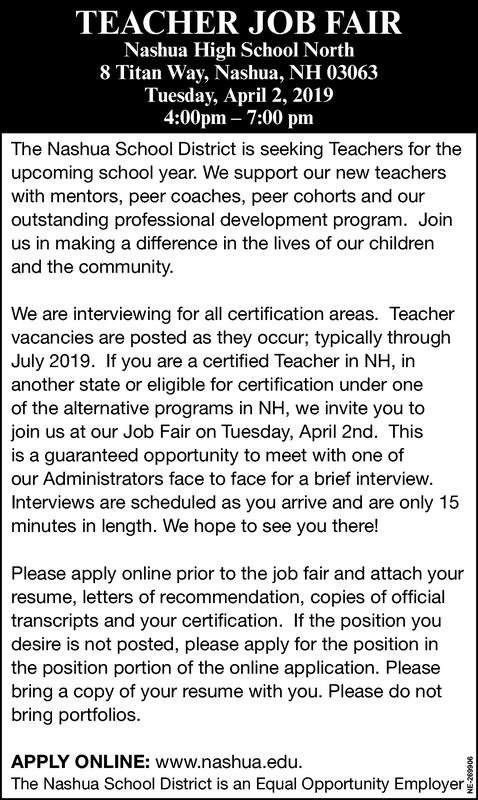 If you are a certified Teacher in NH, in another state or eligible for certification under one of the alternative programs in NH, we invite you to join us at our Job Fair on Tuesday, April 2nd. This is a guaranteed opportunity to meet with one of our Administrators face to face for a brief interview. Interviews are scheduled as you arrive and are only 15 minutes in length. We hope to see you there! Please apply online prior to the job fair and attach your resume, letters of recommendation, copies of official transcripts and your certification. If the position you desire is not posted, please apply for the position in the position portion of the online application. Please bring a copy of your resume with you. Please do not bring portfolios.